In the last post, TOPS Financial Analysis #1 – 2011, Revenue Top Line, I provided a quick look at the revenue sources for the Town of Parry Sound (TOPS) in 2011. In this post I’ll summarize the expenditures for the same period – 2011. This is again a top line look at the figures, I’ll tear them apart in future posts, so hang tight and check out the big picture of where the money goes. 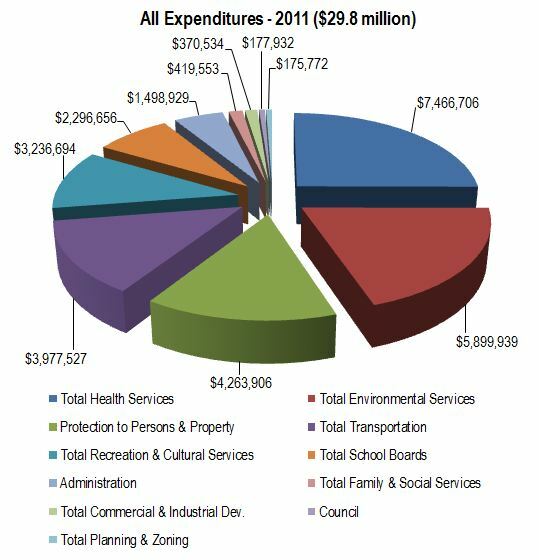 The chart below provides a broad summary of the general areas of expenditures for TOPS in 2011. To make it a little easier to understand there is a table with the same data right below the chart. Total expenditures in 2011 amounted to $29.8 million as opposed to total revenues of $28.0 million. That is a shortfall we will need to look at in more detail in a later post. For now though let’s try and understand where the money went. In the next post I’ll explain what costs fall under each of these rather large expenditure categories.